In a perfect world, the services of John and Laura Roach would not be needed. But as a district court judge and a family law attorney, respectively, they know that’s far from reality. So, they have made it their mission to help divorcing couples keep the process amicable — and keep the family as intact as possible — while trying to save the marriages that can be rescued. Mediation is the key, said the Hon. John Roach Jr. (J.D. 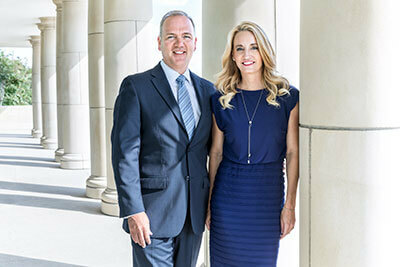 ’97) of the 296th Judicial District Court in McKinney and his wife, Laura Roach (J.D. ’96), a partner with the firm Albin Roach PLLC in Frisco. By seeking solutions through mediation, which requires communication, they can sometimes solve problems in a day that accumulated over the course of an entire marriage, Laura said. The couple recently published a book, Divorce in Peace: Alternatives to War from a Judge and Lawyer, and launched a website, divorceinpeace.com, which connects clients with other professionals, including other attorneys and a child counselor, who are as committed to this gentler approach to divorce as the Roaches. John recalled coming home from work over the years and talking about the ill effects of divorce they witnessed in the court system. The couple decided they wanted to make a difference on a macro level and, in 2008, began drafting a book focusing on divorce law in Texas. Their aims expanded last year after Laura mediated a divorce case for a Major League Baseball player. The player had spent more than $1 million in legal fees in the four months prior to Laura’s mediation. She said she was able to settle the entire case in a matter of days and the player’s agent took note. The agent wanted to let all her players know about this approach and urged the couple to aim for a national audience with their book. During the process of writing the book, Laura decided that they needed to go one step further beyond informing readers — they needed to connect them with the right professional help through fellow experts who have pledged to put their client’s interests ahead of their own. John said he feels the work that the couple does has helped keep them together. “When a couple is going through their issues, they don’t talk about it and so they don’t see the opportunity to compare themselves with other husbands and other wives. I’ve been able to compare our relationship with 10,000 other couples,” said John, who values being able to see the big picture. The couple met when they were both in law school at St. Mary’s University. After law school, John moved to Plano to open up his own civil law practice but said the phone kept ringing with family law cases. “The personal nature of family law really got to me, and I believe in being an advocate not only for the client, but for their children,” said John, who was elected to his judicial position in 2006. In the meantime, Laura interned and later worked as a prosecutor with the Bexar County Criminal District Attorney’s Office. Eventually, Laura left the DA’s office and joined John’s firm, now called Albin Roach PLLC, where she still practices. She estimates that 90 percent of her time now is committed to mediation. When couples do part ways, Laura said having a mediated agreement reduces the odds that they’ll head back to court, since they were involved in the outcome rather than receiving a judge’s verdict. And once in a while Laura’s mediation will avert a divorce entirely. When she puts together a mediation proposal, she said Plan A is a reconciliation agreement and Plan B is an agreement on divorce.